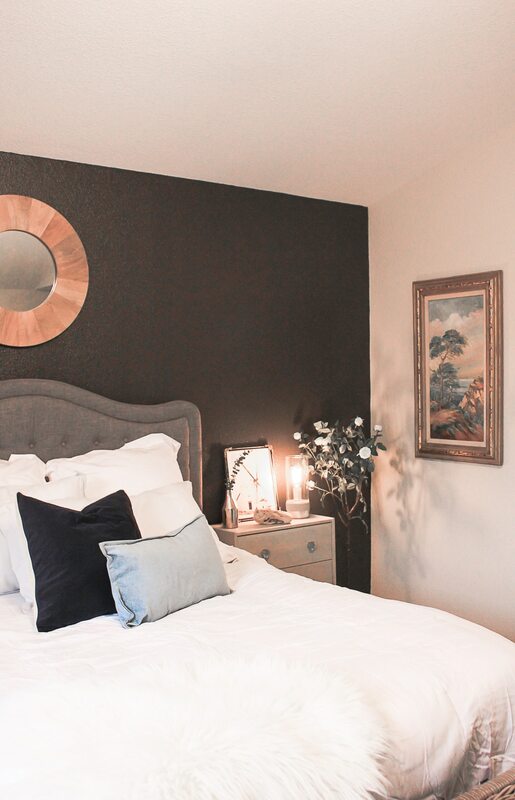 The master bedroom is “where the magic happens,” as they say, and should be a place of happiness and tranquility. But if you’re anything like me, the master bedroom is a place of business (home office), a play area (because, kids! ), and a storage area (for the random junk that doesn’t have a home). 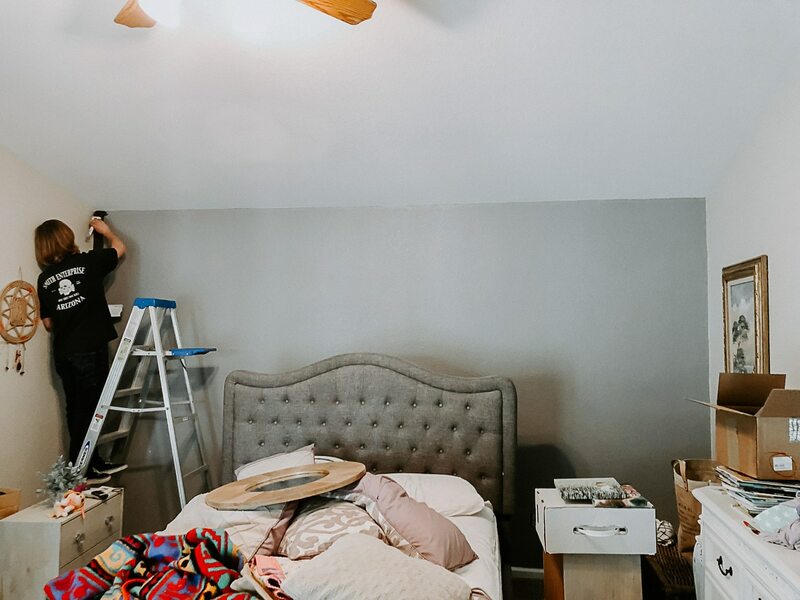 The vibes were all off from the master bedroom accent wall color to the bedding and nightstand decor in my room, so I decided to embark on a budget-friendly master bedroom makeover journey. 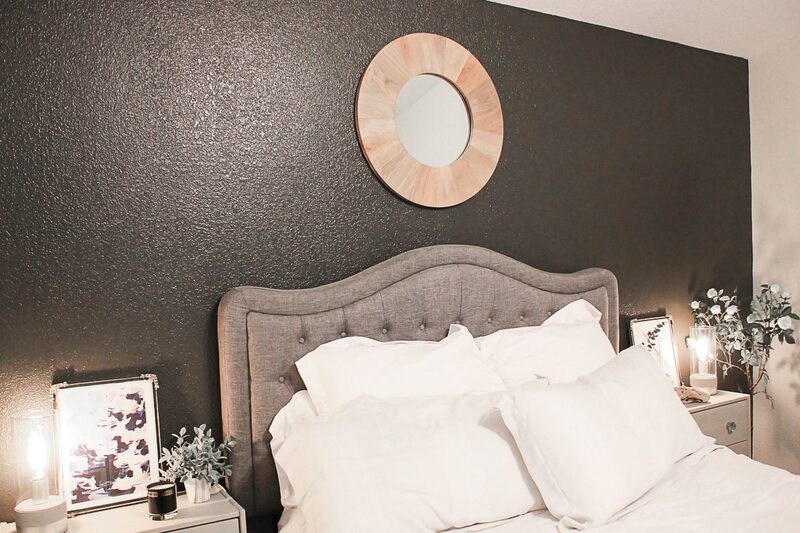 The biggest decision I had to make for my room makeover was the master bedroom accent wall color. 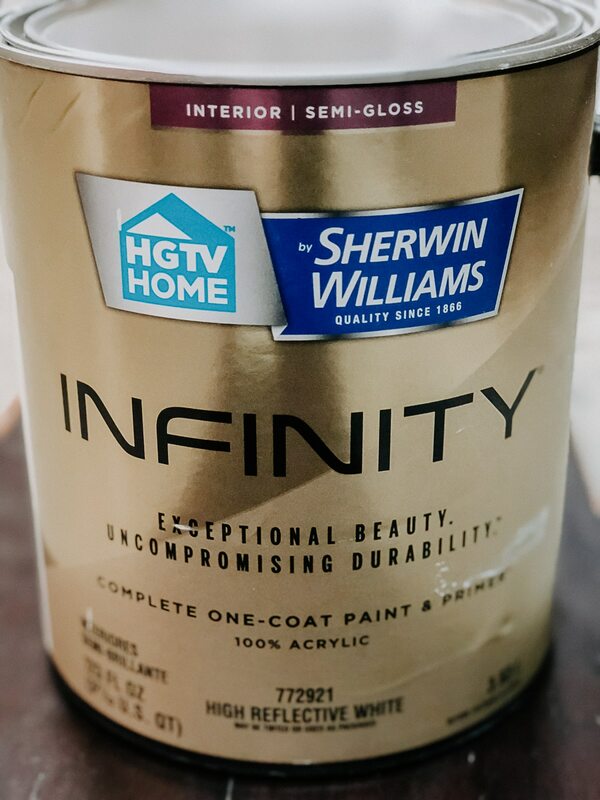 Being that I’m a huge fan of the HGTV brand and Lowe’s, I decided to give one of the HGTV HOME™ by Sherwin-Williams colors a whirl. With four on-trend 2018 Color Collections of the Year from HGTV HOME™ by Sherwin-Williams, it’s easier than ever to bring harmony to your home. Each Color Collection has a range of colors that go together in any combination, helping take the guesswork out of choosing colors and giving your home a sense of room-to-room harmony. 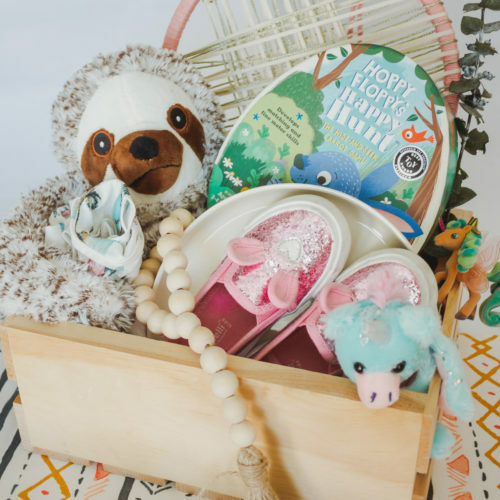 All you have to do is choose the designer-inspired look you want to achieve from themes like Next Journey, Future Thinker, Thoughtful Living or Individual Mix. 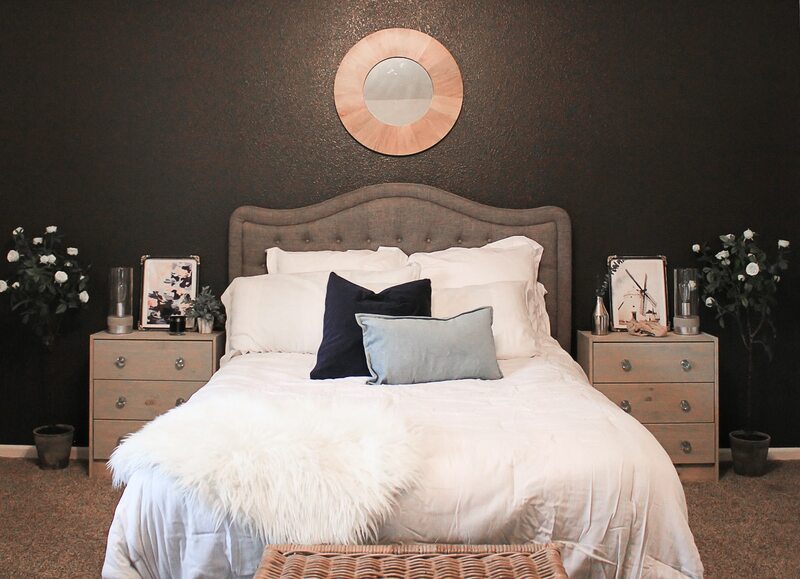 The HGTV HOME™ by Sherwin-Williams color I chose was called Sealskin (HGSW2451) from the Individual Mix Color Collection. My entire wall only needed one one coat of INFINITY Interior Paint and Primer paint and I couldn’t be happier with the color. The paint went on so smoothly, thanks in part to the Purdy paint roller and paint brush that I also picked up at Lowe’s. 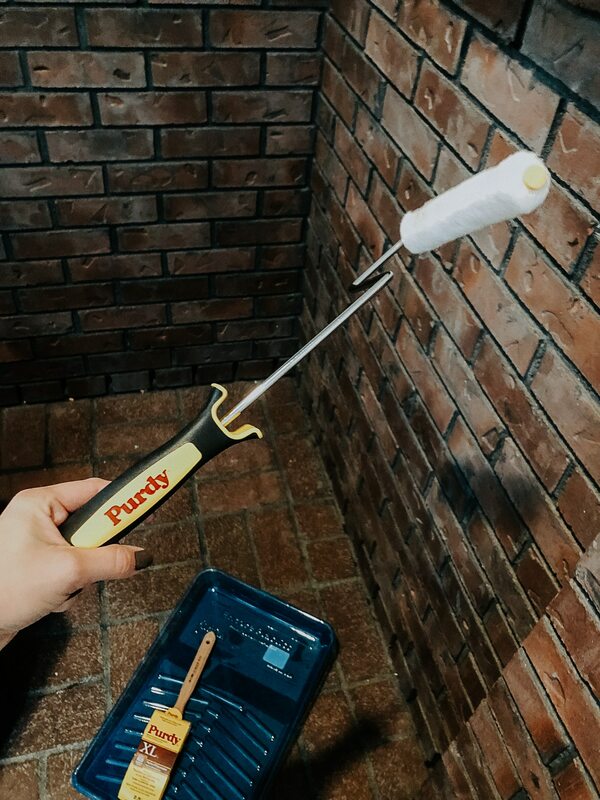 I enlisted the help of my younger brother to help me paint the master bedroom accent wall, since he’s a painter by trade and would’ve been offended if I didn’t ask for his help. He freehanded all of the edges like a champ, and did a fabulous job on my wall. He even complimented me on my paint choice and color. You can also use the HGTV HOME™ by Sherwin-Williams Color Collections to inspire more than just paint colors! Look for similar hues in the upholstery, artwork, and other pieces you decorate with for a perfectly coordinated look, as I did in my room. 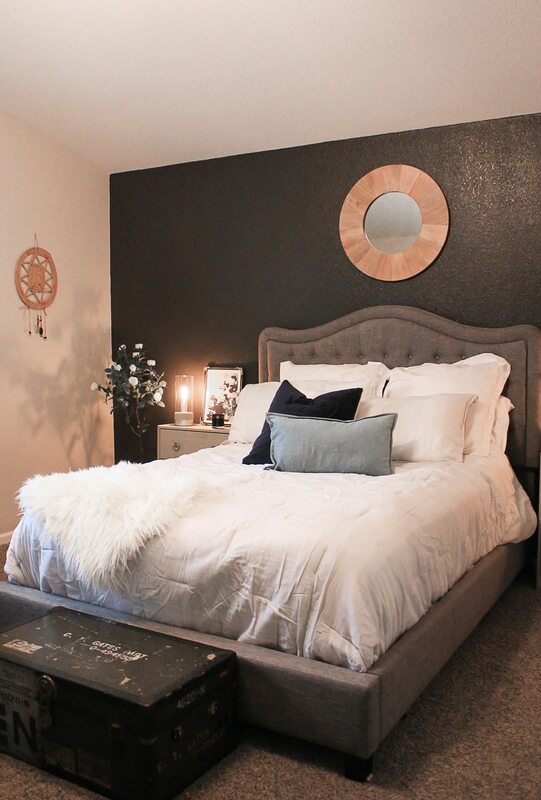 Once I chose the master bedroom accent wall color, I was able to find coordinating bedding and nightstand decor. 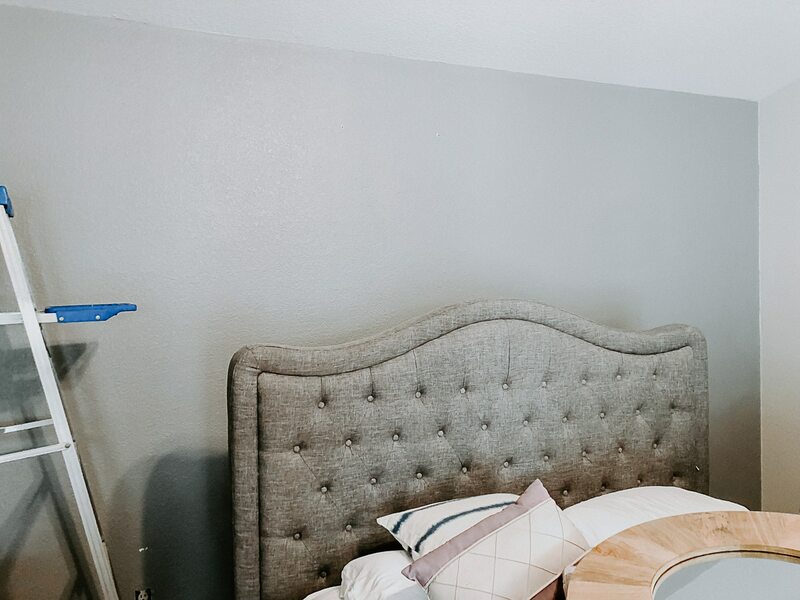 Choosing the master bedroom accent wall color first was definitely the way to go, and I’m so glad I did it that way. I’m a huge fan of rearranging art and furniture, and admittedly do so more than necessary, but I was able to use quite a few decor pieces that I already owned in this room makeover, cutting the budget down quite a bit. I purchased new shadeless lamps with Edison bulbs, a small fake plant, and a small silver base. I already owned the nightstands, both the woven baskets and the old military trunk used at the foot of my bed, artwork, and driftwood. It’s a new year, so why not refresh your home with some of the colors from one of the four HGTV HOME™ by Sherwin-Williams 2018 Color Collections of The Year? 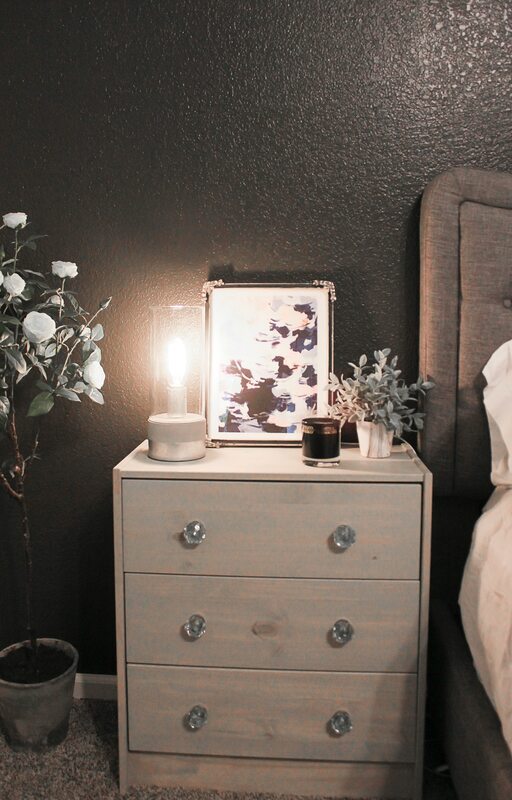 You can completely revamp your own master bedroom for less than $100 like I did by repurposing your old decor. Have a favorite Color Collection? Let me know in the comments section below!